I will introduce traditional Japanese games, Igo, Shogi, Karuta and Hyakuninisshu. Igo is played by 2 players. One player uses white pieces and the other uses black pieces. The one who gains the wider territory will be the winner. The piece will be placed one after the other. If one player surrounds the other 's pieces, he can take the territory. It seems like Othello game, but the piece has one color and doesn't have two sides. And you have to places the pieces on the cross-point. It looks very simple game, but there are not many restrictions where you place the pieces so it actuallyis very complicated. It is said that Igo originally came to Japan from China in Nara era (8th century). Shogi is played by 2 players. The one who capture the opponent's king will be the winner. Each player has 20 pieces (8 different kinds). It is similar to chess, but there are several differences. - The colors of pieces of both sides are the same. We can recognize the owner by the direction. - If you take the opponent's piece, you can use it as your piece. - If you enter into the opponent's territory, you turn the piece and you can move more freely. It is said that the origin of Shogi was Indian game, Chatranger, but the time is unknown. One person recites the phrase written on the reading card and the other players try to find and take the right card which corresponds to the reading card out of many cards scattered on the floor. The player who gets the most cards will be the winner. Normally, the cards on the floor have one letter (Japanese alphabet) and the image corresponding to the reading cards. It is a kind of Karuta. The old famous poems are written on the reading card. Hyakunin means 100 persons, that's because there are 100 poems written by 100 different poets. Among several Hyakunin-isshu, the most famous one is Ogura Hyakunin-isshu whose poems were selected by Sadaie Fujiwara in 13 th century, which have descended as introduction to Tanka (Japanese poem which consists of 31 letters). In Edo era (17-19th century) when the technology of woodblock print developed, the Karuta was made with beautiful portrait of the poets and became popular among common people. The reading card is gorgeous with poem and portait of the poet, but the card on the floor has only later half of the poem and no pictures in contrast with other Karuta. The master of Hyakunin-isshu memorize 100 poems and as soon as the reciter pronounces the first letter of the poem, he can catch the right card. 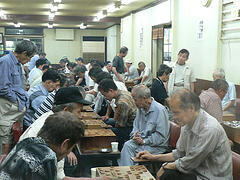 Shogi Club in the town.